It’s one of the enduring issues of this magical time of the year. It can split families wide open, or bring them together in harmony. And it may be answered in part by your family history. Do you open presents on Christmas Eve? Or Christmas morning? And do you know why your family chose one over the other? In my family, I’d always assumed that we opened presents on Christmas eve because of my father’s German heritage. And that’s the way we did it in my family: we older kids kept the younger ones upstairs until we heard the bells ring. We were all supposed to be very quiet and listen for the bells. Only when we were sure we could hear them could we venture down and find the presents under the tree. And afterwards you would see us as we are here, in this picture taken by my father and showing my mother and all of their seven children on a Christmas Eve so many years ago. But yesterday as I was driving from my home to my youngest brother’s home, for the first of several holiday stops this year, I had to wonder… what about my mother’s family traditions? I knew that, on the rare Christmases when we were all well enough to pile into the car and drive the 12 or so hours from New Jersey to Virginia on roads that were not then interstates, my grandparents had allowed us to open presents on Christmas Eve. But I didn’t know if that’s what they’d done when my mother and her many brothers and sisters were little. So, grateful as I always am that there are those I can still ask even after all the losses in our family over the years, I called my Aunt Trisha, my mother’s youngest sister, and asked. “Christmas Eve,” she responded immediately, when I asked when presents were opened in their family. Somehow that didn’t surprise me. But I admit I was a bit surprised — and more than a bit amused — by her answer when I asked if she knew why. Now remember: my mother was one of 12 children born to my grandparents Clay Rex and Opal (Robertson) Cottrell, 10 of whom lived to adulthood. And think about it: the sheer number of presents and the sheer number of bodies gathered around to open them. How about in your family — Christmas Eve or Christmas morning? And why? Christmas morning for us. I think it was because our family was always deeply involved in church activities on Christmas Eve. My Mom and Grandmother sang in the Adult Choir, my sister and I in the children’s choir and Dad was always an usher. Depending on the service schedule it was often almost midnight before we were all home. We decided we would enjoy our gifts much more after a good nights sleep. There was one year when we flew to Florida to visit my grandmother for Christmas – she having decided that Ohio winters were no longer fun. We could not take all our gifts with us so we opened all but one before we left – spreading the opening out over a week or so. That was really fun! My brother and I were allowed to open ONE present on Christmas Eve. The rest had to wait until Christmas morning. We got to choose which present we wanted to open from those under the tree. I always choose one I thought I knew what it was so it would be more fun opening “surprises” on Christmas Day. Oh I like that method, Lyn! Merry Christmas! Great memories, Pat! Merry Christmas! In my youth it was always Christmas morning: Santa wouldn’t come until everyone was in bed, asleep. Sadly that tradition hasn’t lasted, and with the logistics of trying to get nine siblings, their spouses and children (and now the children’s children) together, gift sharing is spread over a week. Merry Christmas and Happy New Year! Love it, Tim (even though I “only” have seven siblings!!). Merry Christmas to you! We were allowed to open one. Now I may be remembering this wrong, but… My mother was an extremely practical woman and she would always say, “open this one, too.” It was always new pajamas or nightgowns. I think she just liked to see us all dressed in festive new jammies on Christmas morning. Love it! Bet you have some great pictures of those new jammies, too! Merry Christmas, Mary! When I was a child, it was always Christmas morning. As an adult, I switched it to Christmas evening, partly because we celebrate in the evening at my in-laws so all the grandchildren can be together. Santa’s gifts always get opened in the morning though. That’s a good system to get everyone together, Deborah! Merry Christmas! Christmas morning — always — except one gift on Christmas Eve. We did the same with our kids and our two younger sons do the same with theirs. The oldest child spends most Christmases with in-laws who live closer, and they do family gifts on Christmas Eve and the little ‘uns get gifts from Santa on Christmas morning. The oldest son has a blended family and they spread Christmas over a week depending on who has kids when. It all works. It’s the spirit that matters more than the timimg. But I think that asking about traditions is important because we take things for granted unless we do. It’s what works that matters, Barbara, but knowing why — building traditions — is key too. Merry Christmas to you and yours! Well, Judy, I was raised like you! We always opened our presents on Christmas Eve. We would have a gift from Santa the next morning. I never asked why – but I think I will call my Mother and ask today. Nice to hear about your traditions, Lori! Merry Christmas! Christmas Eve! There’s no one left for me to ask why, but I suspect it was the German tradition in our home combined with your aunt’s very sensible reason. It was church at 5, a light supper for the children and they were off to bed. The grown-ups had drinks with a huge buffet while they enjoyed Christmas music and conversation until Santa came (sometimes for real in the form of a family friend). He rang the bells and the children came running from their beds (or the floor or wherever, since all the cousins came to our house). After opening gifts, some went back for more food while others went to bed. Christmas morning, we all woke to the wonderful smells of ham and sausage, biscuits and stollen, eggs and pancakes. (I don’t think my mother ever slept on holidays; she just cooked and baked.) Sometimes there was snow and sledding or ice skating, but always the children had new toys and the adults played with them too. After still more food, Christmas dinner with all the trimmings, everyone began to gather their things and go home. We had leftovers for dinner and were ready for bed. Wonderful memories! Thank you for prompting them. Merry Christmas to you, Judy. Sweet memories, Doris! Thanks for sharing them, and have a very Merry Christmas!! As a child, we opened the presents on Christmas morning (except the pajamas sent to us from Nana which we opened on Christmas eve before going to bed) after returning from Mass. But once the last child (there were 6 in our family) didn’t believe in Santa Claus anymore, we opened them on Christmas eve. This did make going to church and preparing Christmas Dinner much easier (and cleaning up the wrapping paper). However with my own children, it has been Christmas morning even though they are now in their 20’s. I guess because we are usually going to someone else’s house for dinner. I love the fact that the pjs had to be opened on Christmas Eve! Lovely memories, Lisa — Merry Christmas! 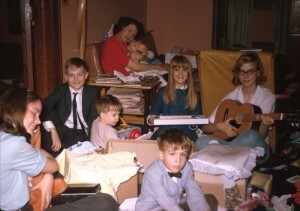 My dad’s family always opened their presents on Christmas Eve (their heritage is primarily Belgian and German). In fact, they had a sort of progressive gift giving. They’d go to one house for food and drink and to see what Santa had left there (and, I suppose, the relatives, too). Then the next family adults would sneak out to get their house ready. By the time the evening was over they’d covered half of Chicagoland, from Whiting (IN) to Skokie (IL)! My mom’s family always did theirs on Christmas Day. They were primarily of German and English extraction, and I don’t know why in particular they did it then. Consequently, we always opened presents from my dad’s family on Christmas Eve, and the rest on Christmas morning. This held regardless of who was visiting whom (we lived across the country from each other, so one year my dad’s family would visit, another year my mom’s family would visit, and another year we would visit them). Eventually I was forceful enough to insist we should open them on Christmas Day, which just seemed logical to me. My brother still wanted to open one on Christmas Eve, so we did that. Now we all get together on Christmas Eve due to separate traditions for Christmas Day, and that’s when we open our presents from each other — the rest still wait for morning.